The second one is a stunning example of precise focus. And it only took me 42 shots to get one like that! Even so, the eye isn't *quite* in focus, because damselflies' heads are so wide (they're like little hammerhead sharks). That's a problem you can only minimize by using a smaller aperture, and in this case I really didn't want all that sand to be sharp, so. I shall be some time escaping the mental image of tiny hammer-head sharks, tails sculling lazily and wafting by on buzzing wings! I have only seen this species once, and managed to take one lousy photo. These are beautiful and tack-sharp! I always thought of them as scarce and shy, but I've had better luck the last few years -- mostly with mating pairs. Many odes are a little more cooperative for photography when mating! Except darners, argh. My biggest problem with darners is finding them in the first place -- I just don't seem to have as much luck as with skimmers or clubtails. Of course if I see them at all, sometimes they're ovipositing way out in the water or patrolling without stopping (Springtime Darner, I'm looking at you). On the other hand, I did find one pair of Canada Darners mating high up in a tree that were so distracted I was able to get the male to climb onto my finger. 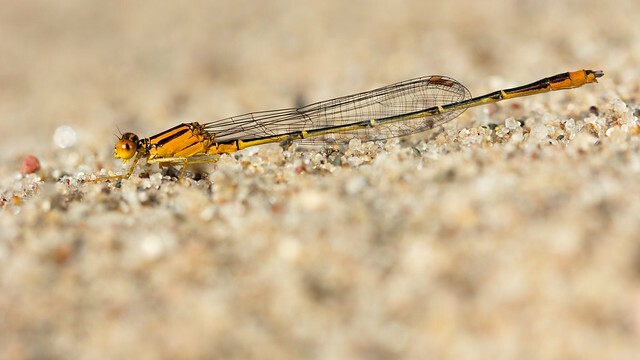 Dennis Paulson's new guide says that Orange Bluets are more likely to come to water late in the day or if it's cloudy, which explains a lot. Most of my photos of them were either taken around 6:30 PM, or on days when the weather wasn't cooperating. I have no problem finding them on the wing, but most don't seem to stop at all except (sometimes) for mating, usually somewhere really inaccessible, like the top of a tree on the other side of a body of water, or ovipositing, usually somewhere inaccessible without waders (and some of the places I go really don't want people wading because they're worried about zebra mussel spread). Every now and then they'll hover nearby, just long enough to taunt me with the possibility of a flight shot, but not long enough for me to focus. They especially like to do this when I don't have a camera. The one orange bluet pair I saw last fall, it was fairly late in the day (and season).